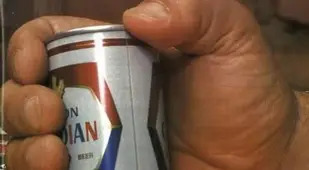 What's the world when you weigh a quarter of a ton and drink 150 beers in one sitting? 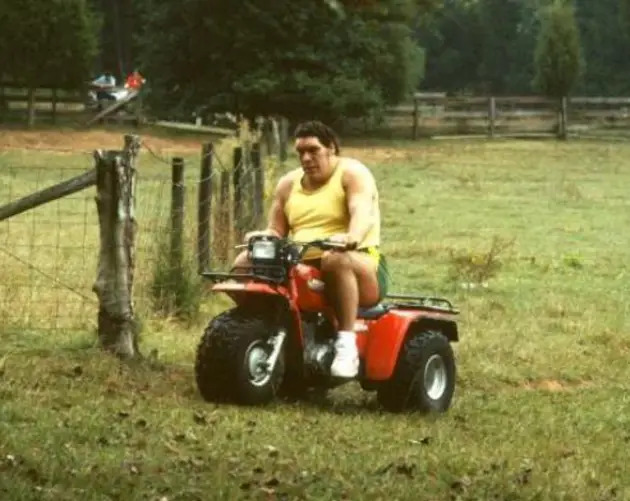 Take a look at these André the Giant photos to find out. 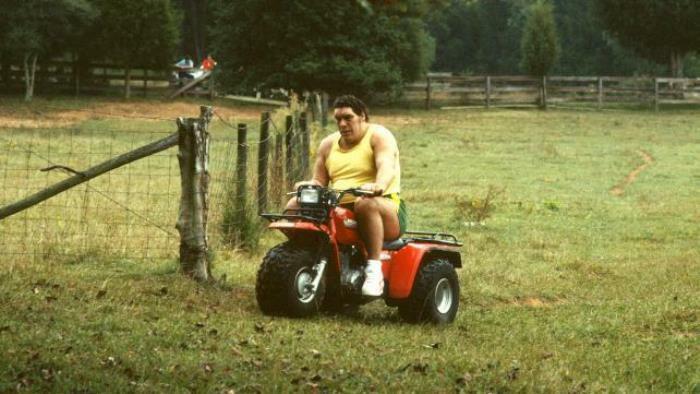 It’s not a stretch to say that André the Giant lived in a different world from the rest of us. 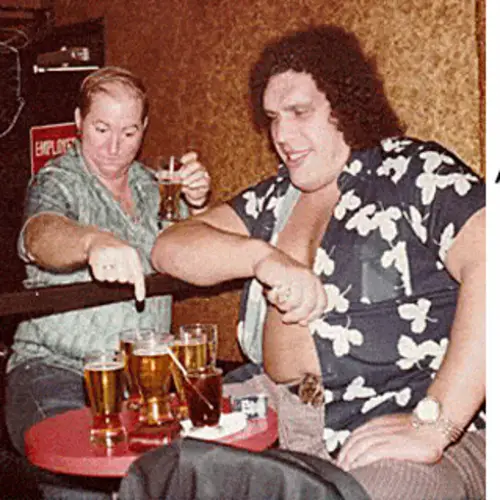 Standing at 7 feet 4 inches tall and weighing in at 550 pounds, André the Giant was famed for his unbelievable physical feats, including drinking 156 beers in a single sitting. This wasn't the only time André lifted Arnold in the air. 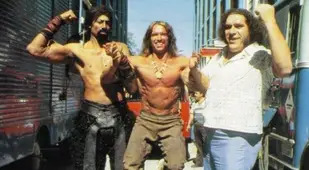 Famous for always paying for his dinner parties (guests included), André caught Arnold Schwarzenegger trying to pay for his own dinner while shooting Conan The Destroyer. André picked Arnold up, deposited him back in his dining chair, and paid for the group's meal. 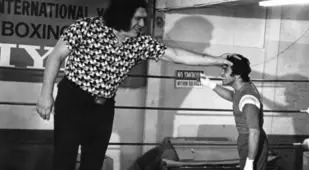 Andre meets professional boxer Bobby Chacon in 1979. 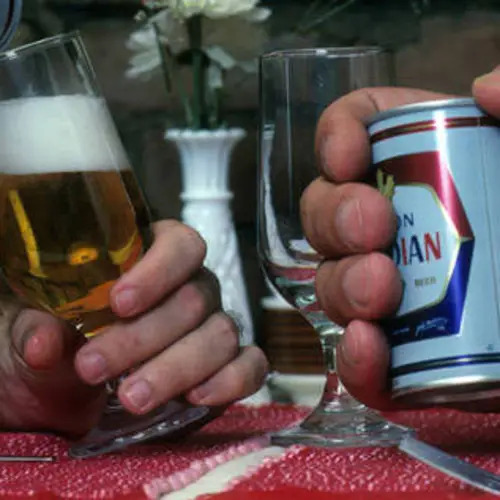 Referred to unofficially as the "greatest drunk on Earth," André once allegedly drank over 150 beers in one sitting. 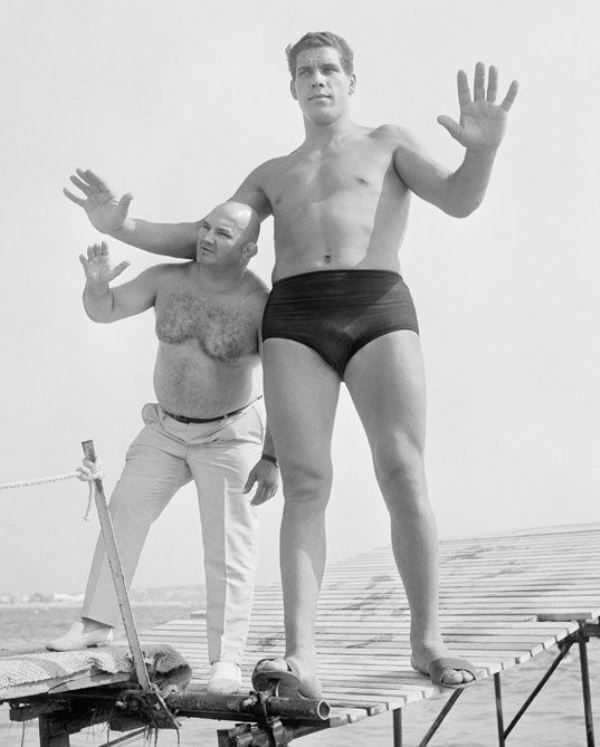 By age 12, André was 6'3" and weighed 240 pounds. 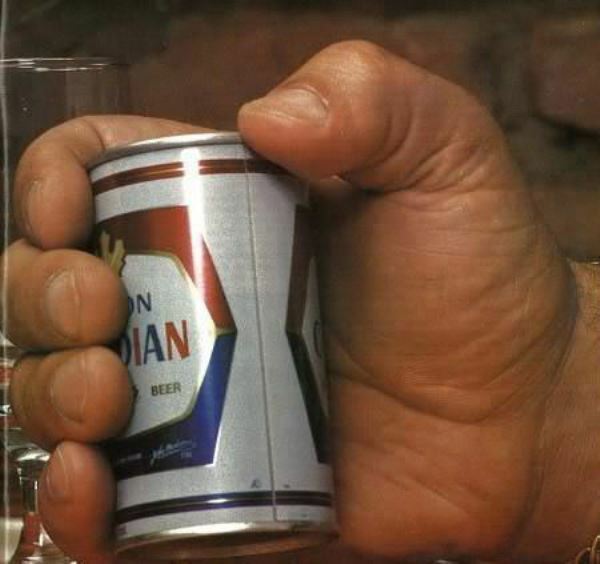 André the Giant and Muhammad Ali compare hand sizes upon meeting in 1975. André was no stranger to lifting things -- his brother remarked that André could accomplish the work of 3 experienced farmhands by his mid-teens. 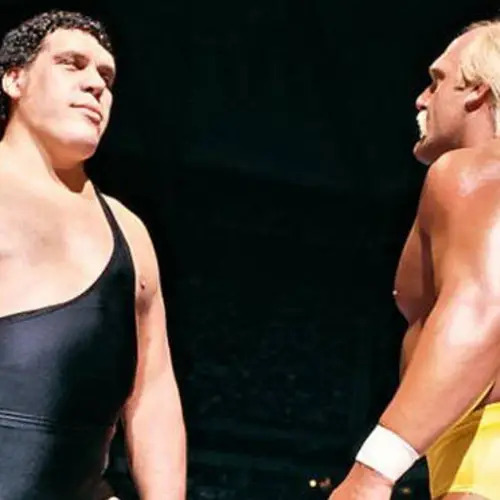 André took center stage at the first ever WrestleMania held in 1985 at Madison Square Garden. André stands next to some of his competitors from the World Wrestling Federation. Nobody captured the wrestling world's imagination like André.Wikimedia Commons. This photograph of André surrounded by women in towels was taken in 1966 during a fashion exhibit in Paris. Andre catches a cab during a visit to New York City in the 1970s. When visiting Japan, André was too tall to use the toilets. Instead, he had to use the bath tub. Andre the Giant hangs out on the hood of a car in New York City in the mid-1980s. 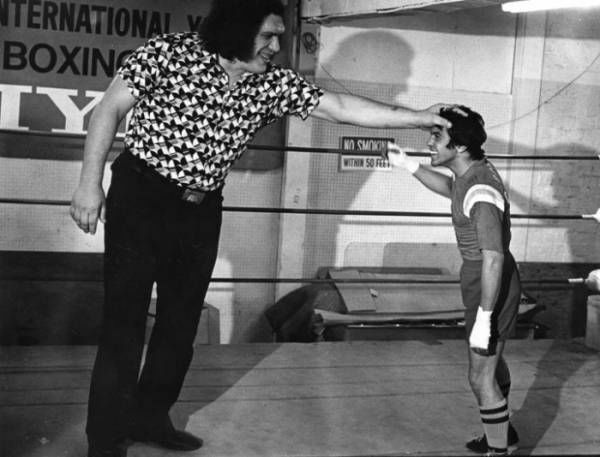 Andre meets a young fan in the late 1970s. Later in life, issues with his back would force André to be less physical, but in his youth, his strength was legendary. 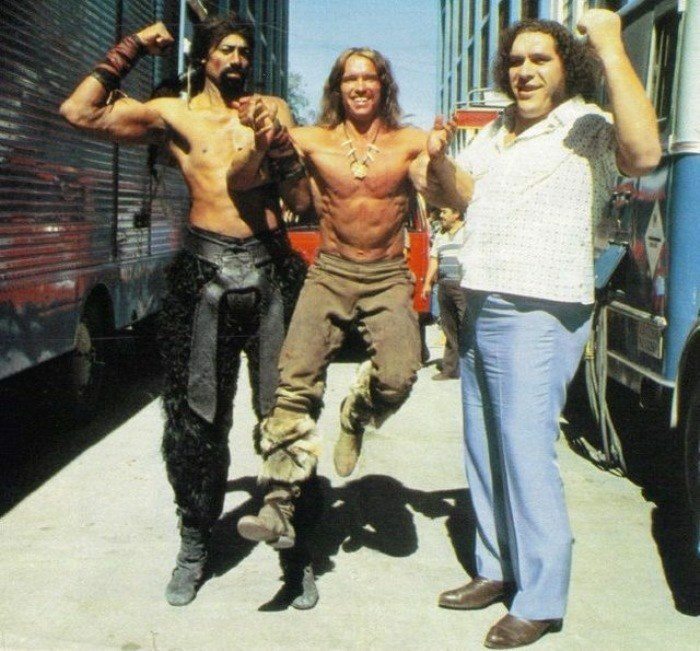 André starred alongside Arnold Schwarzenegger and Wilt Chamberlain in the 1984 movie Conan The Destroyer. 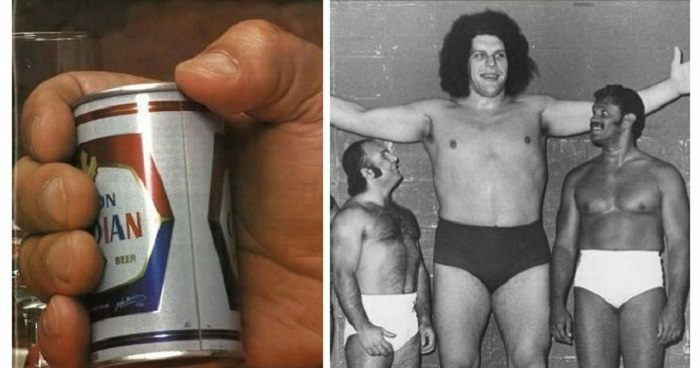 Andre compared to a fellow wrestler in the World Wrestling Federation. ... And when he finally visited. André began wrestling at age 17 and from 1973 to 1987, was undefeated in the World Wrestling Federation. Looking for more jaw-dropping photos? Check out the best of old school cool or see vintage school photos of your favorite entertainers. And before you go, be sure to like All That's Interesting on Facebook!